Hear exhibiting artists Melanie Jayne Taylor and Linda udge, with special guests Sandra Bridie and Greg Gerrand, discuss the archive and use of history in the creation of new works. 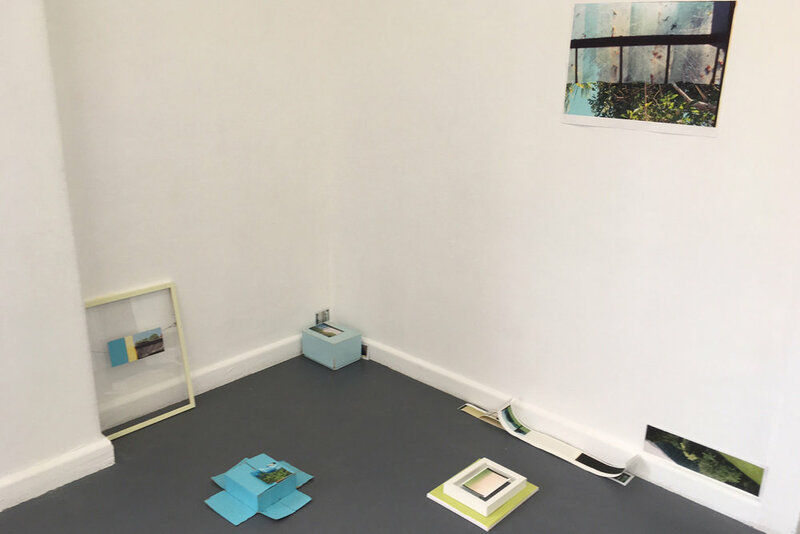 For All The Gardens I Could Find, Melanie Jayne Taylor exhibits the processes involved in creating a comprehensive cataloguing system for the all the material in her personal photographic archive related to gardens. In consultation with cataloguers and archivists, she explores the slippages between traditional classification systems and subjective, intuitive interpretations. IMAGES | Melanie Jayne Taylor, Summer Structure (detail), 2016, All the Gardens, Could Find, Perth Institute of Contemporary Art | Image courtesy of the artist. The cataloguing of objects or images into an archive is meant to be a process of rigorous, objective ordering. But your ‘cataloguing’ is a very subjective, emotional response concerned with drawing on your own memories How do these two seemingly disparate or contradictory approaches sit together? Lets take the ‘Series’ or ‘Grouping’, Summer Structure. It contains several photographs and fragments of photographs – one of which depicts a manicured garden with a pathway dappled in afternoon sunlight, it was taken in London in the early summer of 2008. Descriptive information about this picture could include: subject matter - ‘Garden’, ‘Paths, Garden’, ‘Seasons’ ‘English picturesque gardens’; location - ‘London, England’; date of creation - ‘2008’. But then there are also the emotional elements - my memory associated both with that moment in time in which the picture was taken and all those other times I’ve engaged and interacted with the picture since its conception. The way I’ve grouped this photograph with others in the structure, derives from the intersection of all these different elements. And now, this particular grouping has again shifted the emotional impact of the images and where they are stored in my memory. So does the cataloguing process then give clues to the viewer to help them experience and interpret the works? Or is it a way that allows you to make connections between elements in your archive and construct the work? It’s both those things. For instance, the way I’ve dealt with the pastel pink that is featured in some of the photographs included in the Summer Structure grouping. 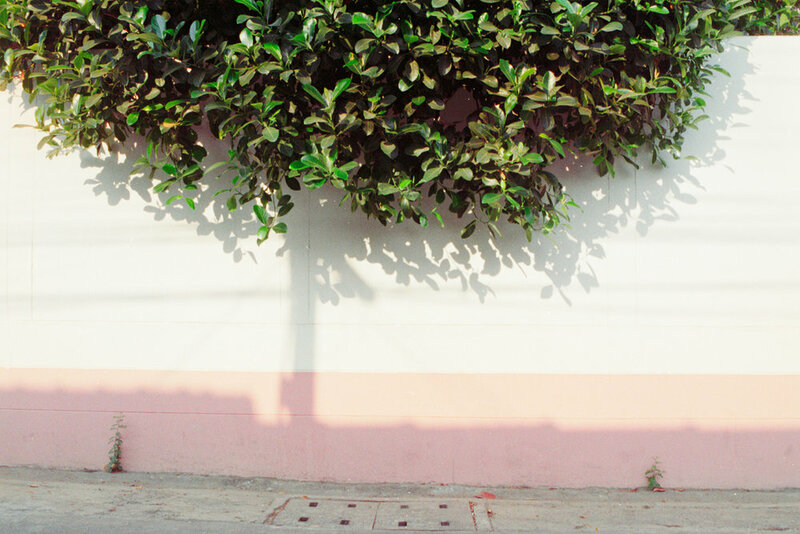 For me, that shade of pink evokes a softness and a feeling of melancholy that may lead me to reach toward a particular image or grouping of imagery that are also imbued with that same sensation, but not necessarily featuring that colour. Or they may feature that colour… The point is, that my emotional and intuitive responses become an internal method of ordering and sorting through the works. If I choose to include the pastel pink as part of another structure, it could provide a visual clue to prompt the viewer into forming connections between the groupings. During this process of ordering and sorting a fluorescent pink Post-It© note, with the ‘AMPLIFY’ written on it has been added to the archival objects. Is that a reminder to yourself and does it now become part of the work? … But now that fluorescent pink Post-It© note becomes that ‘amplification’ of the dusty pink captured in the photographs. And the same with the intense green tape which is used to hold down these strips of images. The Post-It© note and the masking tape become the marginalia of your personal archive that point to the making of Summer Structure as well as highlighting the contents of the photographs and objects. The structure is the artwork but it also makes visible the process of assembling the work where we can see the hand of the archivist/artist at work. 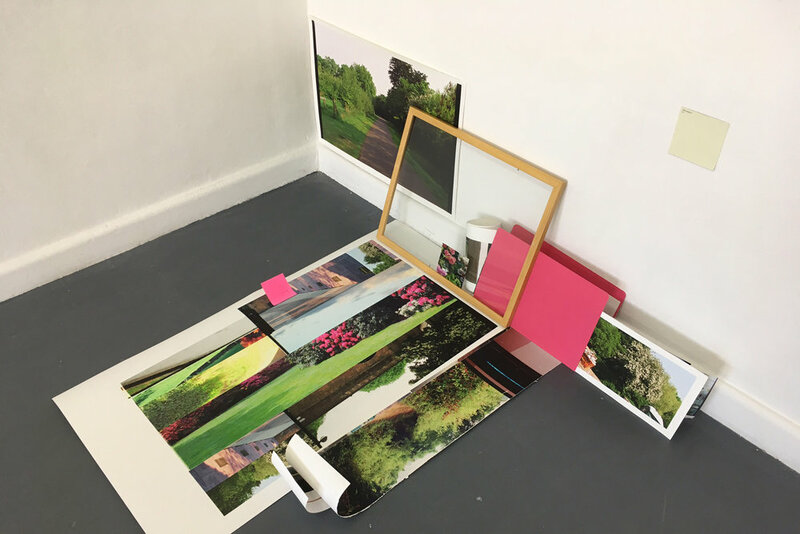 The viewer is able to make the connection between the visual cues in the work –the dappled light, the pink wall, the green foliage and tape – that you find in different parts of the work. Yes and the title of the project ‘All The Gardens I Could Find’ does refer to this process – its almost like an impossible quest, as I search within this vast archive of mine for all the garden material and attempt to catalogue all the possible connections. There are so many variables and variations to consider (which is why it is an on-going project). These pictorial structures are reflective of the actions involved in this searching and sorting process. The structures are open ended and, as their name suggests, they are a scaffold that allows you to add to them. So this is one particular manifestation of these images that could change in another time and space. It’s not finite and could be the starting point for another structure. Are there overlaps between the structures? Yes, definitely. The structures are by no means fixed and the act of re-arrangement is fundamental to my practice. My role differs quite significantly to the work of an archivist who won’t disturb the original order of a collection or engage in any physical re-arrangement so as to retain the original context of the collection. In my work, I am continually renewing the relationships between the imagery so as to ensure my collection maintains the context of the present. For instance dappled afternoon sunlight depicted in the photograph of the manicured garden pathway in London becomes an incentive for me to reach toward another image which features the same quality of light, but photographed 6 years later in an entirely different location (Soft Light on the Hedges). I start to unpack and explore the narrative and formal connections between these two works and consequently, other imagery or elements will enter into this process which is also in relation to my readings of the spatial qualities of the site of installation. This is how the structures are developed. I like how you describe the structures as open ended and I particularly like your use of the term ‘scaffold’. This project evolved out of desire to finally grasp a handling over this mass of material that I’ve accumulated over these last twelve years or so of taking pictures. Gardens - with their reference to growth, renewal, order, chaos, nature, control, collections, structure, beauty, sublime… - seemed an appropriate subject matter to focus on for this investigation. While in the studio at PICA, I’ve been in the process of developing new systems, frameworks or a ‘scaffold’ if you like, to apply to my archive as a whole. The structures are internally consistent but also refer to other elements within the exhibition. I really like the objects that you use to store, frame and reorder the images used in the structure – the stack of polaroids, the envelope that has stored another print, the background that you might re-photograph an image on. Do these mechanism for storing, reimaging or archiving become integrated as a part of the art work? Yes, this method of display suggests that the order is not fixed – the material is still in a state of being processed, organised and sorted and meaning is always in a state of flux. Philip Goldswain interviewed Melanie Jayne Taylor at the Perth Institute of Contemporary Arts, Friday 28th October, as part of her residency in the Studio Program. This is an edited transcript of that interview. Philip Goldswain is a lecturer in architectural history, design and photography at the University of Western Australia. He is also a research fellow at the State Library of Victoria for 2016/2017. The development and realisation of this work was supported by the Perth Institute of Contemporary Arts’ Studio Program. Melanie Jayne Taylor would like to thank Greg Gerrand, Genevieve Pergl and Leonie Triolo of State Library of Victoria for their ongoing guidance and assistance.